Those moving from the GTA or Vancouver will view overall Ottawa average prices (average residential selling price approx. $447,000) as a real bargain and that would be correct. Averages are just averages though and price ranges vary considerably across the city and the Ottawa real estate board reporting area. Urban residential price averages in 2018 are in the $600-$900K ranges and topped $1.5 million in Rockcliffe Village. Suburban prices are more affordable in the $400-$500K range in most cases. Prices have been increasing fairly strongly in the last couple of years, and limited listing inventory is a factor. Ottawa is quite spread out east to west along the Ottawa river some 45 km (Carp Rd to Trim) and about half that distance north-south. Dominant features include the Ottawa and Rideau River systems, the Rideau Canal and the “Greenbelt”, all of which have factored in Ottawa’s development. North of the Ottawa river is western Quebec, the Gatineau hills and the city of Gatineau. Realtors must be separately licenced/registered to practice in Quebec, so very few, if any, can provide services on both sides of the Ottawa River. Average prices are about $100,000 less on the Quebec side, so buyers should determine which province is of most interest from the beginning of their search. Much of Ottawa’s residential growth over the last couple of decades has been at the fringes in the east (Orleans), west (Kanata and Stittsville) and south. (southwest in Barrhaven and southeast in Findlay Creek and Riverside South) Home prices have increased most in urban areas and this has fostered many condo developments and infill housing development in the highest urban demand areas. We currently have several of the largest mixed residential urban neighbourhood projects in Ottawa history underway or planned. These include: Wateridge, LeBreton, Greystone and Zibi plus numerous large (and tall!) condo projects. Ottawa is a big education centre with over 80,000 full time post-secondary students (140,000+ counting part time) at University of Ottawa, Carleton, Algonquin, Cite Collegiale and St. Paul’s. This demographic has an impact on housing, entertainment, dining and the work force. Ottawa has always been a transit oriented city with commuter ridership % among the highest in North America. The OC Transpo system has been built on a mix of dedicated transitways (bus only roads) and express bus lanes which connect urban and suburban commuters with the downtown core. 2018 brings Phase 1 of Ottawa’s LRT (Confederation line) which will connect 13 stations over 12.5 KM, including a 2.5KM tunnel underneath the downtown core. Phase 2 will expand the scope both east, west and south (Trillium Line) by 2023. This has created a “transit oriented development” focus for city planners and a great deal of activity is planned around LRT transit hubs. When one drives through Ottawa from the downtown towards the suburbs, the city seems to stop and then restart after large swathes of open space. This was created way back in the day when the original plan was to keep Ottawa within the borders of this “Greenbelt”. Over time, persuasive developers found a way to build new communities beyond the Greenbelt and this is where much growth has taken place since the 1970’s. We have a gamut of schools at the elementary and high school level encompassing English, French and immersion programs from public, Catholic and French school boards. The widespread geography of Ottawa has become a bit of a problem in this regard, as demographics have changed school enrollment patterns and many schools are on the “to be closed” list due to lack of students while others are overloaded and still others have no local services at all. Researching schools for both current and future requirements can be a key factor for many parents, so it is a good idea to review this early in your Ottawa home search to determine your geographic focus. Every market is different, so be careful not to assume that things in Ottawa real estate will be the same as the market you are moving from. Housing types/styles, trends and key features and highest demand items in one local market may vary widely from those in another. The Ottawa real estate market has been improving steadily since spring 2016 and 2017 was probably the best year in a decade, with overall unit sales up 10.2% and prices up 6.8% for residential properties and 3.4% for condos. The good news is Ottawa is still very affordable compared to many places across the country and one of its most stable markets. Tougher news for buyers will be listing availability in 2018 and definite upward pressure on prices, as listings have fallen to very low levels all across the city. New listings were down 8.7% over the course of 2017 and that trend is worsening already in 2018 with new residential listings in January down 30% compared to the 5 year average. Overall listing levels are down 21.7% for residential listings at year end and 27% for condos. With increasing numbers of sales and lower numbers of new listings, the supply-demand balance will be swinging even more in favour of sellers, so buyers will have to be very aggressive and prepared for a tough seller’s market. 1) have your team in place, so you are 100% ready to buy: Realtor, mortgage broker, insurance broker, inspectors, lawyer. Make sure you and your spouse/partner are on the same page concerning priority level of housing features. 2) know your financial plan and pre-qualification levels before even looking at a property. Know whether you will need a property appraisal and if the new 2% qualification threshold applies to your file. Understand home operating and utility costs, as this may vary from your existing geographic location. For example: property taxes may be higher or lower and ditto for heating, electrical or water costs. Ottawa has much higher property taxes than Toronto per $ of assessment, for example and we also have rental hot water heaters which those from out of Ontario may not know. 3) have a realistic target of home by type, area, features and price and narrow that as quickly as possible. No sense chasing rainbows in a tough market for buyers. Wishing you can get the $525K house for $475K will not make it so. 4) have a plan for multiple offers. Well priced new listings will be attracting multiple offers, so discuss your position in advance with your Realtor. 5) consider builder quick occupancy inventory, as many builders are building some homes on spec to be available for peak delivery months ie summer. 6) search online for exclusive listings and other non MLS® posted properties. Many are “trying” listings out on 3rd party sites and social media before posting on MLS®, so you may find listings on social media groups or via search engine alerts. 7) drive through your geographic areas regularly (if possible) to look for new lawn signs popping up. New ones may have toppers that say: “coming soon” or “exclusive” listing. These may be good choices if you can find them before other buyers. The fragmentation of listings from the central MLS® system makes it difficult for buyer agents to stay on top of all new listings appearing in your areas of interest and one cannot be satisfied that electronic means will be sufficient in getting you in to see the hot new listings, before other buyers. Ottawa real estate is seeing the strongest results in at least 7 or 8 years and overall is considered to be a seller's market right now. (June 1, 2017). Not a happy prospect for those moving to Ottawa but on the flip side, our price increases have been very low the last 5 or 6 years and overall prices are still very reasonable compared to other large metropolitan areas. Historically, our market is very stable and does not experience the degree of volatility of many other markets, so investing in Ottawa real estate is still a pretty safe choice. As demand has grown over the last 12 months, we have seen sales and average prices rising while inventory levels have decreased. Multiple offers are more prevalent, quality listings are selling even more quickly and combined with some tighter bank mortgage qualifying rules, this has resulted in challenges for both buyers and sellers. Anecdotally, we are seeing almost double the number of condtional sales falling through which is partly explained by mortgage hiccups and also inspection issues. Give us a call if we can help with your relocation plans! Here is a summary of average selling prices by housing type based on results for year-to-date 2016. These are only averages of course and will vary by area, age of house, house features etc. Our current residential real estate market has seen unit sales increases but fairly flat prices and is probably one of the most stable markets in the country. Decreasing listing inventory levels during 2016 have moved us from a market which favoured buyers in 2014 and 2015 to what we believe is a balanced market though there are signs that supply/demand metrics may soon be favouring sellers, so higher price increases are possible, as listing inventory continues to tighten. Unit sales in residential properties have been pretty solid in 2016 with a 5.5% increase in the number of units sold but prices continued pretty flat (as has been the case for 4 years) with an average price increase less than inflation of only 1.2%. Condo unit sales improved quite significantly in 2016 with an increase of 9.6%. Average condo selling prices condo pretty flat with an average price of $260,880 through November 2016. New construction sales have been strong all year with sales up 18% compared to 2015. Listing inventory had been elevated to some historical highs over 2014 and 2015 and fortunately, these levels have eased significantly in 2016. New listings have declined by approx 7% this year and the number of listings available at the end of November 2016 shows residential listings down 14.3% and condo listings down 13.3% from a year ago. This is a very positive development and a key area to watch in 2017, as it is a great indicator of supply/demand in the market. Price ranges dramatically across the city with highest prices in the core urban areas with much more affordable choices in the suburbs. Also a wide range of properties in the exurban or sub-rural areas for those who want more property in exchange for a commute. Strongest sales demand is in the $300-$400K and $200-$300K price ranges and these will be properties that should sell most quickly. 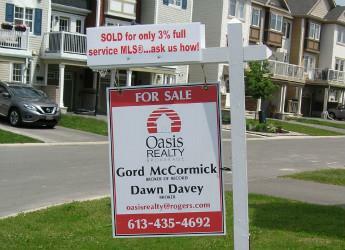 Ottawa continues to be great place to buy a residential property! Whether you are new to the city or returning from elsewhere, we believe we offer the highest possible quality buyer representation at our independent local brokerage. We have moved corporately ourselves many times and understand the challenges and extra stress associated with adjusting to a new position and a new home. We do our absolute best to make your buying process as efficient and effective as possible. We both possess our Broker registration/licence which only 20% of the REALTOR® membership has achieved. We are not a high transaction brokerage but rather focus on high quality individualized services which we feel provides the best service level and response times possible for our clients. As a boutique brokerage there are less “moving parts” and we are both intimately involved with every aspect of your service delivery and file.